Home / News / Showbiz / Viral / Look Pauleen Luna's Baby Girl Photos, "Sino Nga Ba Ang Kamukha?" 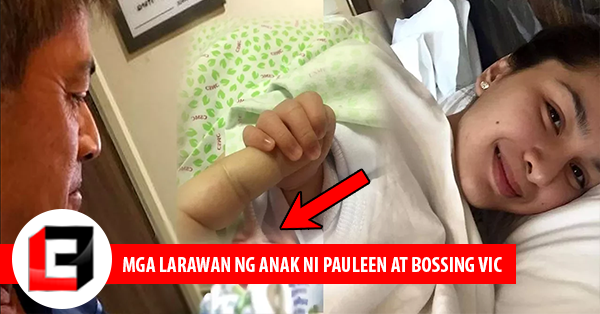 Look Pauleen Luna's Baby Girl Photos, "Sino Nga Ba Ang Kamukha?" Yesterday, Vic Sotto surprised the dabarkads and the viewers as well with a great news. He didn’t go directly to the point by announcing that someone is celebrating her birthday today but later revealed that it’s his daughter Baby T is the one celebrating her literal ‘birthday’ yesterday. With the great news, many were delighted especially the “Eat Bulaga” dabarkads. According to Vic Sotto, before he left the hospital, his newly born daughter was very energetic and jokingly described Baby T’s energy as literally bouncing. “Ayun, pag-alis ko ng ospital lumulundag-lundag pa rin,” Vic pertained to Baby T as a bouncing baby girl. Since Vic and Pauleen are considered as a power couple, many had anticipated the birth of their firstborn especially their families and friends who had shown their utmost enthusiasm during the last weeks of Pauleen’s pregnancy. As a matter of fact, the power couple had attended several baby showers for Baby T organized by their families and friends.And finally, the long wait was over yesterday when Bossing Vic Sotto announced the great news about the new addition to their family particularly the Sotto clan. Furthermore, Vic said that he and his wife Pauleen Luna will be sharing photos of their daughter one of these days. However, their close friend Ruby Rodriguez came to social media first to share a glimpse of Baby T.
With proper respect to Baby T’s parents, the photo Ruby Rodriguez’s shared with Baby T was limited. The photo didn’t reveal the face of Baby T by covering part of her image with a heart sticker. Despite not revealing to the world yet how Baby T looks to know who she resembles most, it’s no doubt that Baby T would be the next face of baby products because of her genes. Well, as of now, let’s just wait for Vic Sotto and Pauleen Luna to share to the public Baby T as they’re still enjoying their first days as parents to the newborn child. Read also the previous article: Kapag Nakita Niyo Ang Mga Barya Sa Isang Puntod Ay Wag Na Wag Niyong Gagalawin. Baka Ito Ang Mangyari Sa Inyo!